2. That this distinction may be the more manifest, we must consider that the Providence of God, as taught in Scripture, is opposed to fortune and fortuitous causes. By an erroneous opinion prevailing in all ages, an opinion almost universally prevailing in our own day — viz. 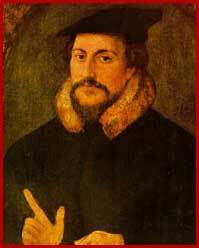 that all things happen fortuitously, the true doctrine of Providence has not only been obscured, but almost buried. If one falls among robbers, or ravenous beasts; if a sudden gust of wind at sea causes shipwreck; if one is struck down by the fall of a house or a tree; if another, when wandering through desert paths, meets with deliverance; or, after being tossed by the waves, arrives in port, and makes some wondrous hair—breadth escape from death — all these occurrences, prosperous as well as adverse, carnal sense will attribute to fortune. But those who have learned from the mouth of Christ that all the hairs of his head are numbered (Matthew 10:30), will look farther for the cause, and hold that all events whatsoever are governed by the secret counsel of God. 3. Truly God claims omnipotence to himself, and would have us to acknowledge it,——not the vain, indolent, slumbering omnipotence which sophists [quibblers] feign, but vigilant, efficacious, energetic, and ever active—— not an omnipotence which may only act as a general principle of confused motion, as in ordering a stream to keep within the channel once prescribed to it, but one which is intent on individual and special movements. God is deemed omnipotent, not because he can act though he may cease or be idle, or because by a general instinct he continues the order of nature previously appointed; but because, governing heaven and earth by his providence, he so overrules all things that nothing happens without his counsel. For when it is said in the Psalms, “He has done whatsoever he has pleased,” (Ps. 115:3), the thing meant is his sure and deliberate purpose. It were insipid to interpret the Psalmist’s words in philosophic fashion, to mean that God is the primary agent, because the beginning and cause of all motion. This rather is the solace of the faithful, in their adversity, that every thing which they endure is by the ordination and command of God, that they are under his hand. But if the government of God thus extends to all his works, it is a childish to confine it to natural influx. Those moreover who confine the providence of God within narrow limits, as if he allowed all things to be borne along freely according to a perpetual law of nature, do not more defraud God of his glory than themselves of a most useful doctrine; for nothing were more wretched than man if he were exposed to all possible movements of the sky, the air, the earth, and the water. We may add, that by this view the singular goodness of God towards each individual is unbecomingly impaired. David exclaims (Psalm 8:3), that infants hanging at their mothers breasts are eloquent enough to celebrate the glory of God, because, from the very moment of their births they find an aliment prepared for them by heavenly care. Indeed, if we do not shut our eyes and senses to the fact, we must see that some mothers have full provision for their infants, and others almost none, according as it is the pleasure of God to nourish one child more liberally, and another more sparingly. Those who attribute due praise to the omnipotence of God thereby derive a double benefit. He to whom heaven and earth belong, and whose nod all creatures must obey, is fully able to reward the homage which they pay to him, and they can rest secure in the protection of him to whose control everything that could do them harm is subject, by whose authority, Satan, with all his furies and engines, is curbed as with a bridle, and on whose will everything adverse to our safety depends. In this way, and in no other, can the immoderate and superstitious fears, excited by the dangers to which we are exposed, be calmed or subdued. I say superstitious fears. For such they are, as often as the dangers threatened by any created objects inspire us with such terror, that we tremble as if they had in themselves a power to hurt us, or could hurt at random or by chance; or as if we had not in God a sufficient protection against them. For example, Jeremiah forbids the children of God “ to be dismayed at the signs of heaven, as the heathen are dismayed at them,” (Jeremiah 10:2). He does not, indeed, condemn every kind of fear. But as unbelievers transfer the government of the world from God to the stars, imagining that happiness or misery depends on their decrees or presages, and not on the Divine will, the consequence is, that their fear, which ought to have reference to him only, is diverted to stars and comets. Let him, therefore, who would beware of such unbelief, always bear in mind, that there is no random power, or agency, or motion in the creatures, who are so governed by the secret counsel of God, that nothing happens but what he has knowingly and willingly decreed. 6. As we know that it was chiefly for the sake of mankind that the world was made, we must look to this as the end which God has in view in the government of it. The prophet Jeremiah exclaims, “O Lord, I know that the way of man is not in himself: it is not in man that walks to direct his steps,” (Jeremiah 10:23). Solomon again says, “Man’s goings are of the Lord: how can a man then understand his own way?” (Proverbs 20:24). Will it now be said that man is moved by God according to the bent of his nature, but that man himself gives the movement any direction he pleases? Were it truly so, man would have the full disposal of his own ways. To this it will perhaps be answered, that man can do nothing without the power of God. But the answer will not avail, since both Jeremiah and Solomon attribute to God not power only, but also election and decree. And Solomon, in another place, elegantly rebukes the rashness of men in fixing their plans without reference to God, as if they were not led by his hand. “The preparations of the heart in man, and the answer of the tongue, is from the Lord,” (Proverbs 16:1). It is a strange infatuation, surely for miserable men, who cannot even give utterance except in so far as God pleases, to begin to act without him! Scriptures moreover, the better to show that every thing done in the world is according to his decree, declare that the things which seem most fortuitous are subject to him. For what seems more attributable to chance than the branch which falls from a tree, and kills the passing traveler? But the Lord sees very differently, and declares that He delivered him into the hand of the slayer (Exodus. 21:13). In like manners who does not attribute the lot to the blindness of Fortune? Not so the Lord, who claims the decision for himself (Proverbs 16:33). He says not, that by his power the lot is thrown into the lap, and taken out, but declares that the only thing which could be attributed to chance is from him. To the same effect are the words of Solomon, “The poor and the deceitful man meet together; the Lord lightens both their eyes,” (Proverbs 29:13). For although rich and poor are mingled together in the world, in saying that the condition of each is divinely appointed, he reminds us that God, Who enlightens all, has his own eye always open, and thus exhorts the poor to patient endurance, seeing that those who are discontented with their lot endeavor to shake off a burden which God has imposed upon them. Thus, too, another prophet upbraids the profane, who ascribe it to human industry, or to fortune, that some grovel in the mire while others rise to honor. “Promotion cometh neither from the east, nor from the west, nor from the south. But God is the judge: he puts down ones and sets up another,” (Psalms 75:6, 7). Because God cannot divest himself of the office of judge, he infers that to his secret counsel it is owing that some are elevated, while others remain without honor.